One of my favorite dressings for salads, spinach and vegetables, sometimes pasta too, is Green Goddess. Since becoming veganish, I have not been able to have any but have occasionally bought a bottle for my mother, because she loves it too, and told me so did my grandmother. Anyway, I finally got down to business and researched a few recipes online. I then attempted to create my own Veganishta version, and I like it a lot. I am going to try experimenting with some different fresh herbs, however, as time goes on. I think I have a pretty good basic recipe down nonetheless. 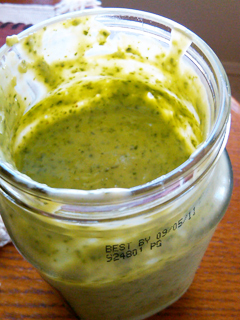 Blend all ingredients in food processor, except olive oil and brown rice syrup, until well blended and smooth. Then slowly add the olive oil and brown rice syrup while blending again. Taste, add a little more sea salt if desired. There you have it. 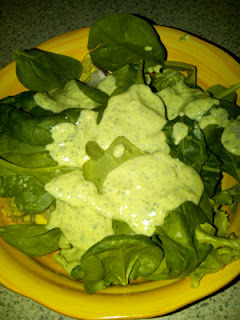 This is my first recipe at this type of dressing. As I said, I am going to experiment with some variations of herbs, etc. I will post again what turns out. Until then, enjoy some greener, very greenish greens loaded with protein!